This year the club are holding salmon events in Scotland and England to encourage more people to try the art of fly fishing for salmon using a double handed rod. 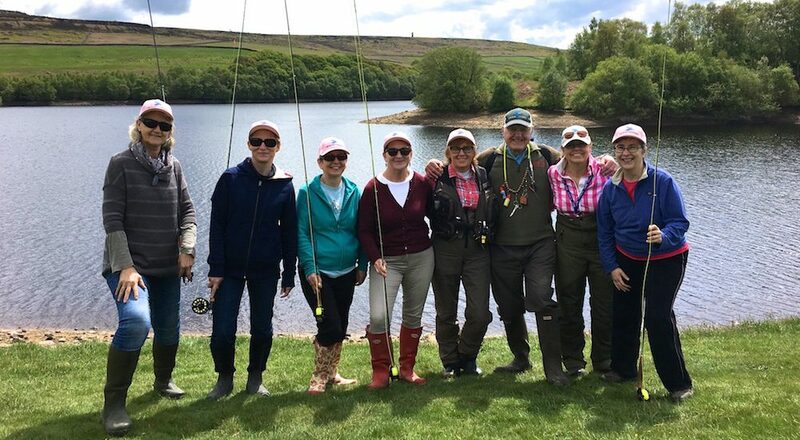 Working with FishPal and individual River Trusts our Chairman Anne Woodcock has organised events in Scotland to encourage a network of fellow female anglers. All events will be held in Scotland, the entire cost will be donated to the individual River Trust. The money raised will go towards funding trust projects working with schools and their respective local communities. All events have been realistically priced to encourage women and young people to try the sport of fly fishing. Casting For Recovery UK & Ireland is a charity close to our hearts, thanks to the kind generosity of Mr Schrocksnadel we are able to continue our yearly fund-raising with a River Tyne ladies salmon day at Eltringham Beat on June 8th. Dates: Chatton Trout Fishery 23rd March. 20th April. 12th May -day change to sunday in May. Dates: Witton Castle Lakes 24th March. 21st April. 11th May – day change to saturday in May. Saturday 1st June we are holding a ladies day on the beat that Miss Morison caught her magnificent salmon in conjunction with the River Deveron Salmon Fisheries Board. The day will consist of tuition, fishing and food – price £45. The cost of the day will be donated to the River Deveron Trust. To book a place please contact Anne Woodcock on 01573 470612 or anne.woodcock@fishpal.com – places are limited. The event will pay homage to this wonderful achievement – more details to follow from the Deveron and FishPal. June 15th. July 13th. August 17th. Places are limited and must be booked. River Annan Trust – Junior Event: Ladies Fishing coaches will be running junior trout days with the trust, every Sunday after the salmon days, aimed at local children. Dates & Times Sunday 10 – 2pm. June 16th. July 14th and August 18th. Cost £3.00. Places are limited and must be booked. The Tay is the home of record fish including the largest ever rod caught salmon in Britain which was caught by Miss Georgina Ballantine in 1922, weighing 64lbs, and which remains the British Record. Anne Woodcock has been working with FishTay Reporter Robert White and Andy Gunn Head Ghillie Newtyle beat to organise 2 days of salmon fishing – all money from these 2 events is being donated to the Tay Foundation and their schools project. Both days AAPGAI, GAIA and UKCC Level 2 coaches will be providing casting tuition. Evening of 5th August – following in the footsteps of Georgina Ballantyne – more details soon.